In college, I was bumped from a regular English class to one more focused on writing. A small group of us met a couple times a week to write, read, share, and discuss. I have little memory of what I wrote, but I remember this class as a bright spot in a schedule packed with challenging science and math courses that tested the limits of my 19 year old brain. I held my breath in those classes- petrified of getting called on to answer a question on material that was in grave danger of slipping right out of my head and onto the floor. In this writing class, I could exhale, play with words, and feel 65% less nervous. The other thing I remember about this class was a girl named Victoria. While I had chipmunk cheeks and looked like I was fresh out of junior high, Victoria had dark eyes and perfect hair. She gave off a Kate Middleton kind of vibe- confident in the way that someone who’s stunningly good looking is confident. Perfect, while the only thing I’d perfected was my awkwardness. I found her fascinating. My poetry was better than hers, but still. But it wasn’t just her looks and confidence that fascinated me- it was the fact that she always wrote with brown ink. 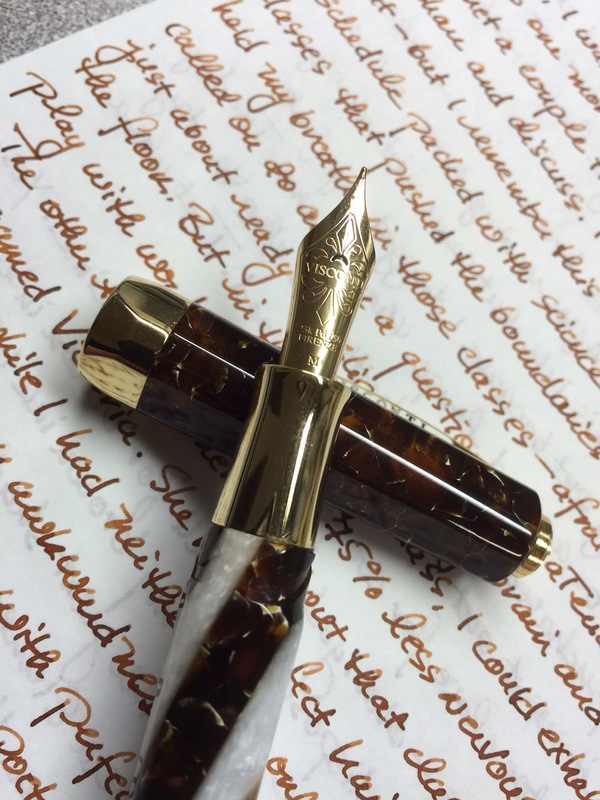 With a fountain pen and brown ink! I scribbled in notebooks with a lousy ballpoint from Woolworth’s, laying down erratic handwriting that tilted to the right for awhile then suddenly leaned back to the left. My script was as random as my outfits, while Victoria’s was as perfect as hers. 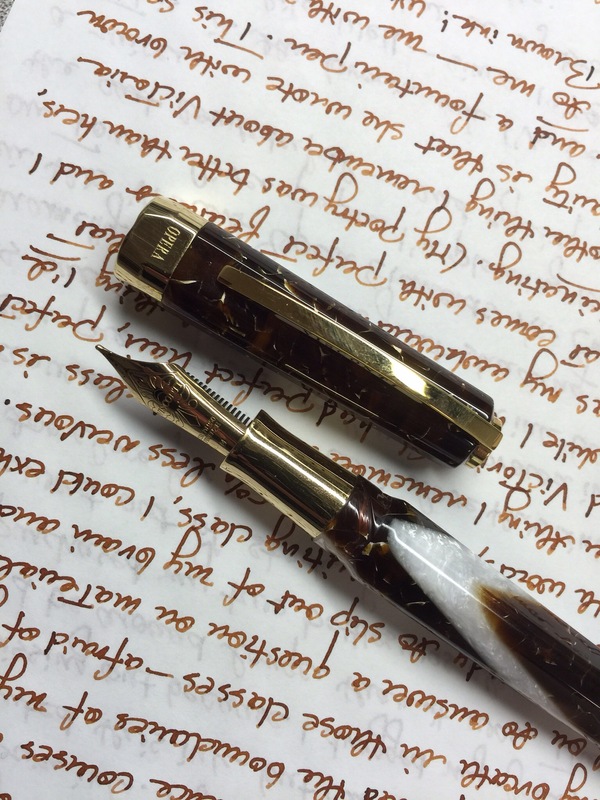 Maybe that class and that girl is why I tend to fall hard for brown ink. I associate it with something that seemed impossibly exotic to little ol’ ordinary me. Victoria and I existed in different orbits, as did our pens and inks. God, I wanted that brown ink. AND that handwriting. Which brings me to this brown ink- SBRE Brown’s brown ink. I came dangerously close to missing out on this, as I stupidly dragged my feet, casually thinking that it’d be around forever. The day that I finally got around to placing my order was also the day that it went out of stock for good. That was a little too close for comfort. Because- ohmigod- do I love this ink. 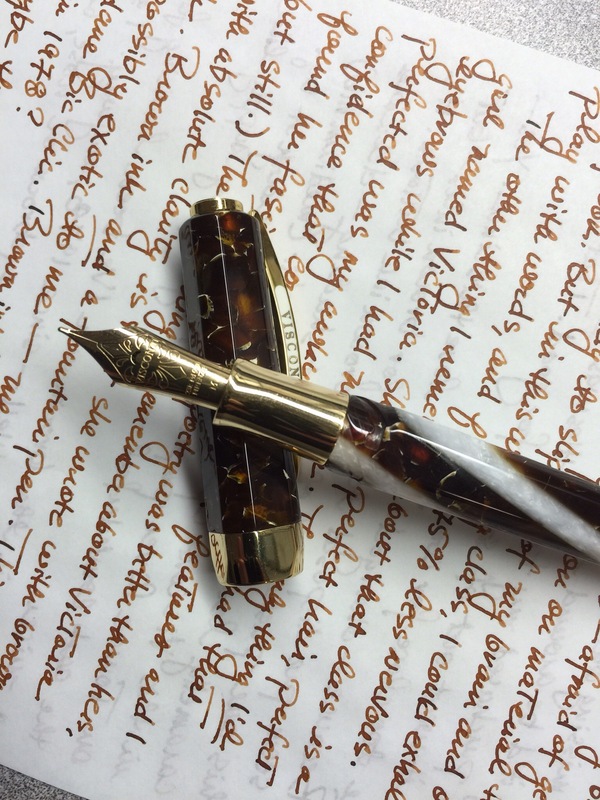 Yes, I seem pre-disposed to fall for brown inks, but this one pushes all of my brown ink buttons like no other. 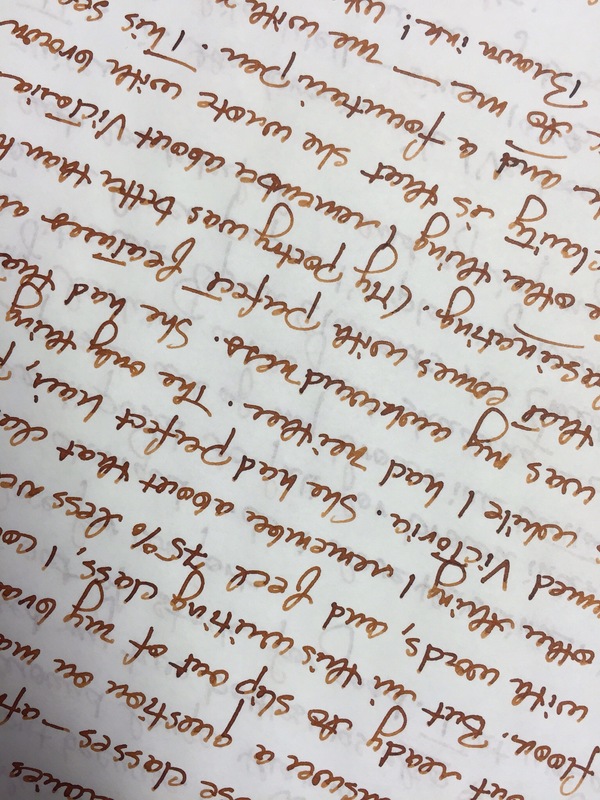 It’s caramelly and rich, with great shading and flow- truly delicious in this Visconti Opera Elements Air, with its medium nib, on Tomoe River paper. I’m plowing through it by the converterful, and fretting about my supply like Scrooge worried over his gold coins. This is the brown ink I’ve been looking for my whole life. Well…since 1978, anyway. My looks are still “eh,” and I still exhibit more than the recommended daily allowance of awkwardness, but who cares. My handwriting eventually came around and I have my brown ink. 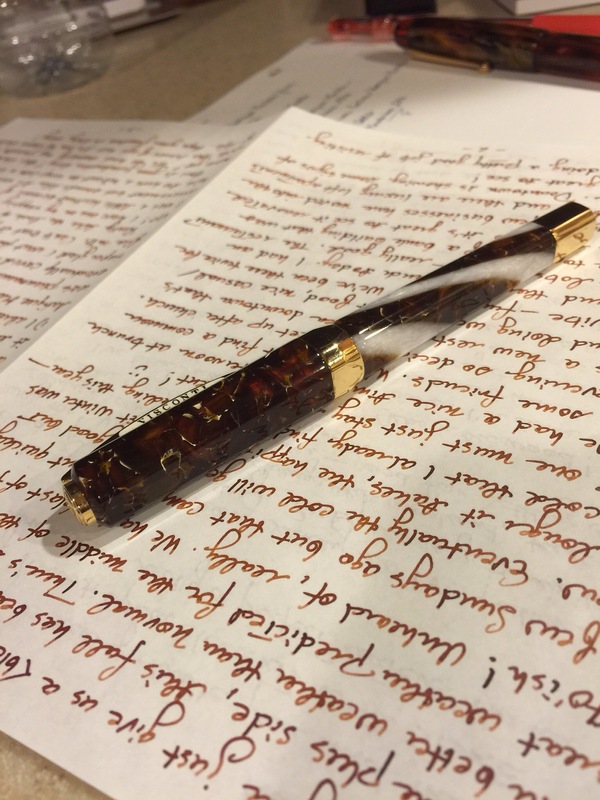 I have THE PERFECT brown ink. 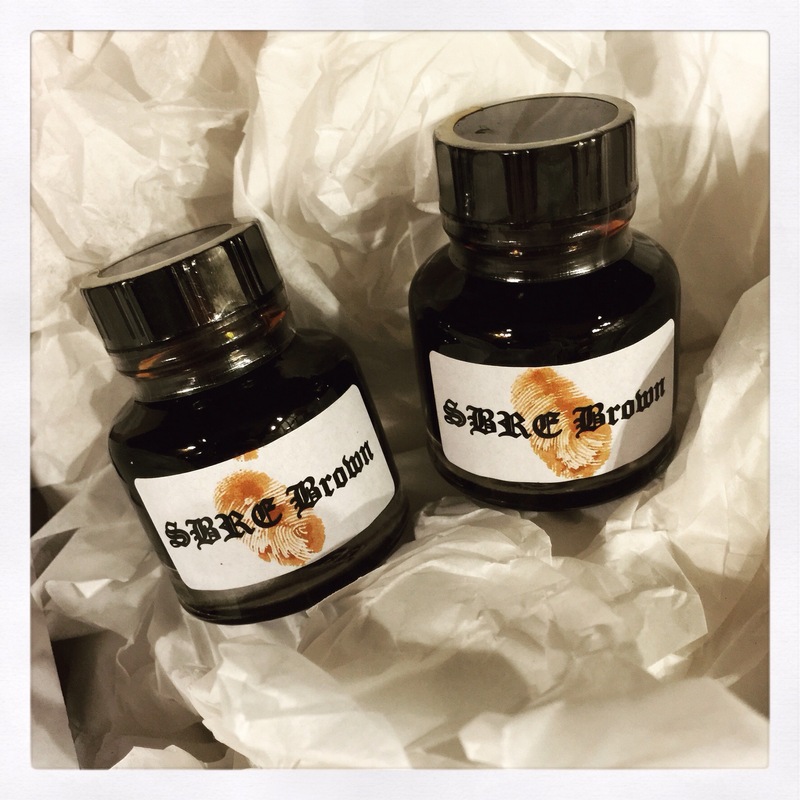 Though his ink is no longer available, you can always keep tabs on what Stephen is up to at http://www.sbrebrown.com/.